“Justice for Bony! Justice for Fredy!” the crowd screamed into the snowy night. 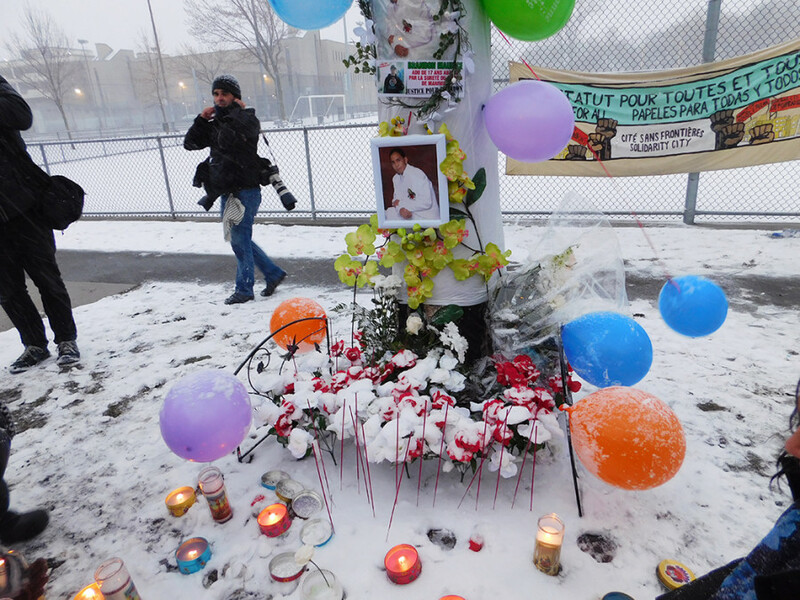 The group of around 300 people gathered in Montreal north on April 6 to pay respect to a black Haitian man named Jean-Pierre Bony who was killed by police. Unarmed, he was shot in the head with a plastic bullet while allegedly fleeing the scene of a drug raid on March 31. Police claimed that Bony was in possession of marijuana. He died four days later in the hospital. The demonstration was preceded by a vigil honouring the memory of Fredy Villanueva, who was killed by police Montreal north in 2008 and whose birthday would have coincided with the demonstration. 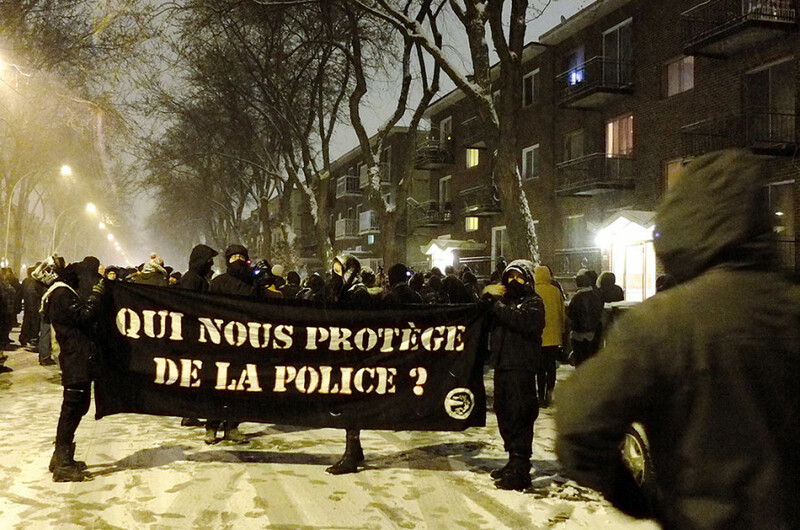 The protest, which was organized by a coalition of anti-racist groups and organizations that fight for police accountability, began in Parc Henri-Bourassa at 8 p.m. and wound its way through the streets of the borough. The crowd stopped in front of the apartment building where Bony was shot, and heard words by people who had been close to him. “You can’t just shoot us and leave us to die for 40 minutes! We’re human beings like everybody else!” one speaker exclaimed. Other speakers discussed the fact that police killed Bony over marijuana, which Prime Minister Trudeau has repeatedly stated that he plans to legalize. The crowd moved on, chanting slogans against the police and demanding justice for Jean-Pierre Bony. Passing cars regularly honked their horns in support, and people left their homes to join the demonstration. Tensions mounted throughout the march, as people discussed their negative experiences with police and grieved the loss of Bony—who was “like a brother to many of us,” according to another community member who spoke into the megaphone. 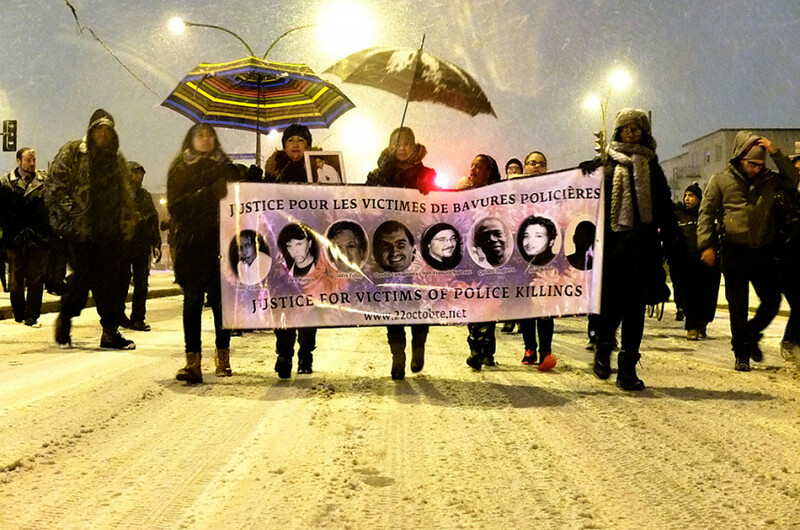 Once the official demonstration ended at Parc Henri-Bourassa, a sizable crowd continued marching toward Service de Police de la Ville de Montréal station 39. The angry crowd moved toward the station, as paving stones were ripped from the street and broken. Upon arriving, the crowd smashed the front windows of the station with the rocks, and one demonstrator painted the acronym ACAB—All Cops Are Bastards—on the front of the station with a paint-filled fire extinguisher. Police, who were parked blocks away, allowed the action to continue for around 20 minutes before dispersing the crowd by pointing laser-sighted firearms at head-level toward the crowd. The type of ammunition which the weapons contained—live-fire or “less-lethal”—is unknown. 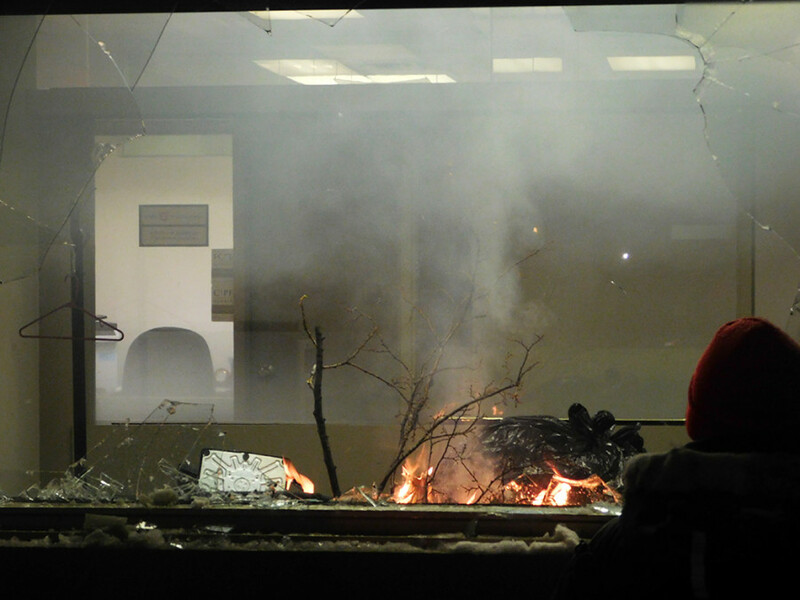 The group then proceeded to break the windows of the Bank of Montreal branch across the street, and attempted to start a small fire inside. The police dispersed the crowd in a similar fashion. Cars were lit on fire later in the night. While the crowd did attack property they saw as symbols of state and corporate power through the night, no actual people have been reported injured by press time. The events bear a resemblance to the aftermath of the police killing of Fredy Villanueva in 2008, who was shot and killed by police for playing dice in a parking lot during the night. That killing also led to mass protests and riots in the Montreal North.